Daily Life in Cambodia – snackettes. Most of our posts highlight specific places or stories that we want to remember; here’s a run-down of the minuscule, everyday things that make traveling and living in Cambodia fun, interesting, difficult, and sometimes just plain weird. Oma lives with her husband, 6 month old daughter, and mother downstairs, while we have the top floor of their home to ourselves. It’s a little dark and cabin-like, but we have tons of space, and we love living in an actual neighborhood rather than in a hotel. In addition to the bedroom and private back deck, there’s a separate living room with some gnarly orange 70’s furniture and a small “kitchen”, which includes a mini-fridge and small table with some dishes for cooking. RIght outside our back door, there is a primary school full of adorable, screaming kids who wake us up at 7 am every morning on the dot. Knowing that I would be at work Mondy-Friday, we did not think this would be a problem… That is until Saturday arrived, when we quickly learned that Cambodian children attend school 6 days a week – Monday through Saturday. All was quickly forgiven though – once they discovered that there were foreigners living right outside their school, their favorite activity became lining up on the upstairs railing to wave at us and scream “hello!” at lunch time– too adorable. A google map of our apartment: Our apartment on GoogleMaps. The only problem with our apartment is that we tend to break things in it or otherwise manage to accidentally break the rules – a lot. One day, after a failed attempt at the barber, I cut Scott’s hair in our bathroom; this meant that the next day our landlord had to come up and unclog all of the pipes leading to the shower and sink (oops!). Ever since the clogging incident, the shower never really worked again, and they had a maintenance man in our apartment every day until we moved out. He was never able to fix the problem, and we ended up taking cold bucket showers for our last full week there. Joke was certainly on us. Next, we managed to get locked out of the family compound one night by coming home too late and leaving our gate key locked inside our apartment. WIth the help of the neighbors across the street, Scott scaled the 10-foot tall security fence and then let me inside. Seeing that it was around midnight, we thought we had gotten in without being see by our hosts. –barbed wire strung across the entire top edge of the security fence. Coincidence? We decided not to ask, and they were too nice to mention the incident. Finally, on our last day living there, while trying to unlock the front door, we accidentally triggered the vertical bolt on the inside of the door to fall down into its notch in the floorboards, completely locking everyone out of the apartment. After 30 minutes of trying to jam our fingers through the door to pull the lock up again, we had once again attracted the attention of all of the neighbors across the street, who then alerted our landlord. We nearly gave our landlord a heart attack (there was no other way into the apartment other than sawing a hole in the wall), but our very-pregnant neighbor and her friend were able to jimmy the lock open by reaching through a crack with their smaller hands. Crisis averted. Siem Reap is full of good food. And because eating out at a restaurants here costs the same as cooking at home, we get to eat every meal out (about $1- $2/ meal)! I thought I would be sick of Asian food after a few weeks of traveling here– surprisingly (and thankfully), I’ve found the opposite to be true; by being here for so long (going on 5 months now), we’ve really been able to delve deeper and experience the extraordinary variety that exists in the cuisine and appreciate the subtleties of flavor as it changes from region to region. And I love every bit of it. For breakfast, we always have the traditional Cambodian noodle soup (our favorite…) at a very local place right across from Angkor Hospital. The first few days, the young staff were absolutely terrified to serve us (since we didn’t speak much Khmer) and would literally push someone else to go wait on us. One day, the girl that was most scared of interacting with us yelled into the back kitchen for someone who spoke a little English to come wait on us– to which I quickly shot back in perfect Khmer, “Hey– I speak Khmer, and I want to order the noodle soup, please!” By day #30, she had finally started to come around… a little. Wow, that’s an embarrassing picture. Scott spends his days working at our favorite cafe in town, Art Deli. It is not only an amazing space, decorated with tons of great local art, but they also make the best homemade iced lime soda in town and have the nicest waitstaff (…occasionally surprising us with free drinks and such:)). We will miss them when we look back on our time in Siem Reap, and I keep wondering, will they still be here, working, when we return some day? I spend my weekdays working in the diagnostic lab at Angkor Hospital for Children (detailed in an earlier post- pictures can also be found in that post). All of our results are written on a large board, which we review with the resident doctor around 11am each morning. On my walk home from work each day, I usually stop in the pharmacy next to my work to love on Doot-doo, perhaps the cutest puppy in the world. His owner always sees me coming and has Doot-doo awake and ready for cuddling by the time I get to the store. Nightlife! One of our favorite bars (anywhere in the world), “Laundry Bar”. Not only did they have delicious cocktails, but they will also burn 20+ movies or music albums to your USB stick for less than $5! All legally, of course…….. (right..?) “Angkor What?” bar, where we found ourselves dancing on occasion… the best part about this bar is the UV lights, which illuminate anything white into an other-worldly glow. The clientele is a little young/backpackery, but it’s hilarious to read some of the things that people write on their glowing white T-shirts before heading out onto the dance floor. “X Bar” had a roof-deck skateboard ramp that Scott would use, prime for watching the sun go down over Angkor Wat. One night we were hanging out at X Bar when we noticed a large, fun-looking group of 20-year old Koreans and a handful of Cambodians hanging out, taking down a serious number of beer towers. An older man in his late 40’s, who seemed to be in charge of the group, wandered over our way and told us that the group was here to volunteer to teach English to kids out in the countryside. He asked us to join the group, so that we could, in turn, help the Korean group practice their English as well (because even though they were teaching it, some of them had only a basic understanding of English). He eventually coaxed us to walk over to the group, where he got everyone’s attention and said, “I just met these nice Americans at the bar; they asked if they could join you.” That wasn’t exactlyhow we remembered the conversation going, but everyone happily made room for us and proceeded to teach us an uncanny number of odd, confusing, and hilarious Korean drinking games. By the end of the night, we were all up dancing to the live band that was blasting out 70’s American rock tunes. Whereas most of us were doing the typical funny/clumsy move-to-the-beat kind of thing, one of the Cambodian guys started doing a traditional Cambodian “Apsara” dance when it was his turn in the middle of the dance floor – I can’t do the dance justice to explain it in words – perhaps it would be comparable to if I started waltzing in a dance club, for example. But he wasn’t joking around – it was simply what he knew how to do. One of my favorite travel memories. Three days a week, I’ve been attending Khmer language classes, which are offered free to hospital volunteers. One of my hobbies has always been learning new languages, and Khmer definitely presented the greatest challenges yet with its difficult pronunciation and sounds. My first week learning Khmer, I tried to ask a waitress at a restaurant (that same noodle soup shop mentioned above, in fact…) what they had available that day in my very best Khmer (since the items that are available there vary from day-to-day), to which she replied “Sorry; no speak English.” Clearly, I needed some work. The next day in class, I told my language teacher what had happened. He laughed and told me that my pronunciation is great and that maybe she was not expecting me to speak Khmer and thus thought I must be speaking English. I had my doubts. The next day, I simply tried speaking more confidently and loudly (since I’m famous for being quiet), and voila! She was so surprised that she looked like she would fall over, but she understood me perfectly. The need for making it very clear to people that we are actually speaking Khmer (and not English) became so essential for one of the phrases that we learned, lest it be deemed that we were just speaking rude English…. That phrase is pronounced “git loy”, and it means “I’d like to see the bill, please,” but we found that it was often confused for us saying rudely in English, “Get me _____!” The waiter would respond, “Get you what?” And we just felt terrible… A clear “git loy” response usually resolved the situation! At the same store, I tried to get a new stick of deodorant for myself, and I was sad to see that all they had was the roll-on kind…ugh. And not only was it roll-on, but it was also “whitening”, which I’m sure has some dangerous side-effects. Having no choice but to buy it, I was not surprised to find that the purported “whitening” effect does not seem to work– that third arm that’s now growing out of my armpit is just not any whiter than the other two. 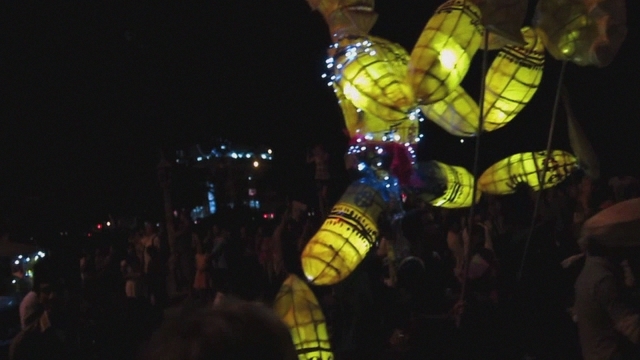 The annual puppet parade through downtown Siem Reap, which was basically a huge street party with amazing giant animal floats that would move their arms and mouths. It put any parade I’ve ever seen to shame!